There are instances where it becomes necessary to send a pre-written email to someone at a later date and time. 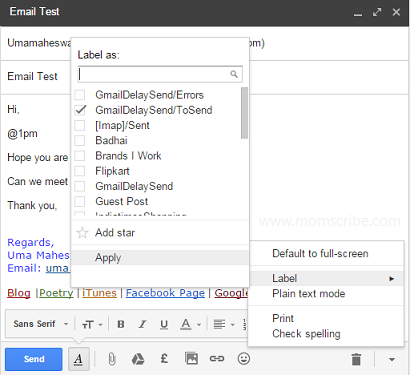 With Google App Scripts API, Gmail has now the ability to schedule sending of messages with just few clicks. For this you will need to install the google script called as Gmail Delay Send which keeps running continually on Google servers. Using this script, we can easily schedule an email to be sent at a later date. "This app needs authorization to run" Click continue. This prompts a request for permission from GmailDelaySendWeb. Click 'Accept'. 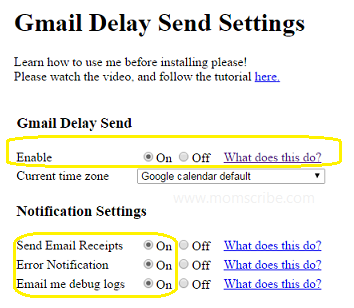 Note that you should click "Enable" to "On" under Gmail Delay Send. This makes the script to run automatically by scanning our inbox every 5 minutes ( as given in trigger under Advanced settings) to see if there are any emails to be sent. 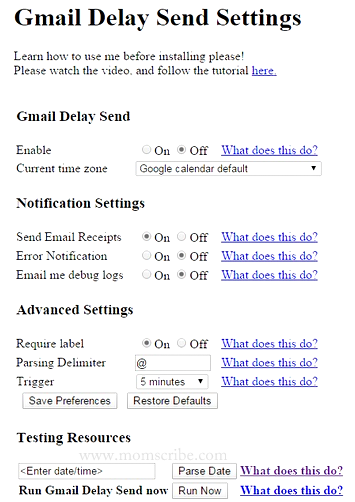 You can also enable your notification settings to make sure that any scheduled email has been sent as desired or not by selecting "ON" under notification settings. Also you can see that there is a special character "@" called as "Parsing Delimiter" under "Advanced settings" which when followed by a particular time tells the time the email is to be sent. Example: '@ 1pm' means that our email will be sent at 1pm.This should come in the first line of email body. See below for the screenshot. After configuring the script, you can draft your email along with the @ future date & time to be sent. 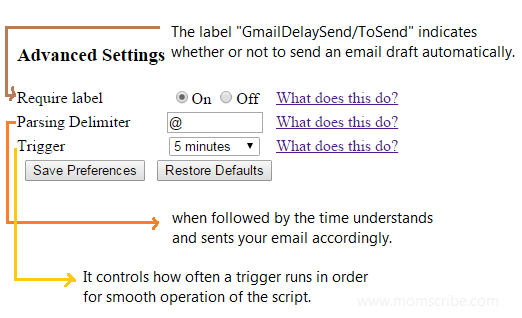 Finally save it as a draft along with the "GmailDelaySend/ToSend" label which is required for the draft to be considered to be sent at the later set date. You can also check your draft to see under which label that is saved. Finally, it is time to see the result of our scheduled email. The Email Test was sent successfully at the scheduled date and time. Thanks for reading this blog. For any queries or suggestion, please comment below. Thanks for the info. Is there any way to stop an email from being delivered to someone after we hit the send button? Sometimes I send an angry email and immediately regret it. Yes,it is possible SG. For this, you will need to go to Settings -> General->under "Undo Send" enable it and set cancellation period to 30 seconds.